Let's be friends: "Daddy, let's play horsey!" 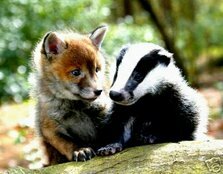 Hey- I know who took this picture! Small freakin' world! My friend just stumbled upon this picture, which she recognized from pictures I'd emailed her months ago.. another friend must've posted it on stuffonmycat. Anyhow, I lived w these 2 animals in a wee little shack in rural Ecuador last year. Frederico, the monkey, would latch on to the cat's back to ride around the yard, and the puss hated it! W/o running water or electricity, this was quite entertaining. I had a monkey once who rescued a cat from a tree. 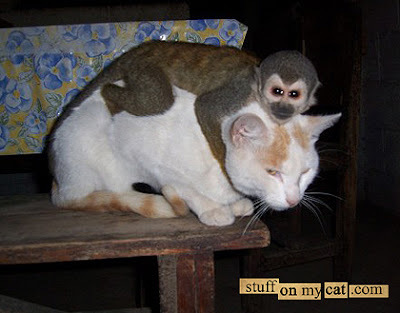 That cat let my monkey ride on his back all the time after that. I think that cat has a monkey on it's back. OH SO SO SO CUUUUTTTTEEEE!!!! that is so awsome!!! !I can't belive that cat will allow that. looks like the cat is chocking. Crazy monkeys. The monkeys in Gibralter will sit on your head if you let them. Oh my goodness! That's just wonderful! The cat looks distinctly unenchanted. I will reccomend this blog to allll of my friends!! "monkey on your back" - this is one time when that's a good thing! wow very nice to look this picture..I like it..
What a piggyback ride! The monkey looks quite pleased.